Are you a lover of paneer ? If yes here is a simple and a healthy recipe for you . We are always advised to include green vegetables in our daily diet and palak is a green vegetable so lets involve palak in our diet by making Palak Paneer for the lunch. Wash the leaves of Palak thoroughly. 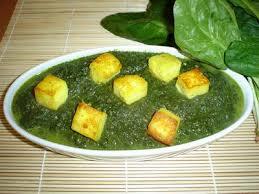 Blend the spinach in a blender and make a smooth paste. Fry it until it becomes slightly yellow. Add the chopped tomato and let it cook for 5-6 minute on simmer. Let it cook further for another 5 minute. Add the fried pieces of cheese to it .